Sincerely, if the grand arena will pair based on gp through out the future matchmaking with only a small fraction of battles being ship oriented, only the character gp should be used in the matchmaking. Its punishing players that invested into ships and pilots. Im sure its going to be a tremendeous fun event.. If you read the summary that was posted it says they’ll be adding ships. This is “season 0”. Basically a trial run. Also food for thought for whomever it may concern: Ship GP is over inflated as a value in general. In TW, ship battles only account for 1/5 of the entire event. Yet it accounts for about 1/2 of a players GP (mods on pilots, ship abilities, etc). 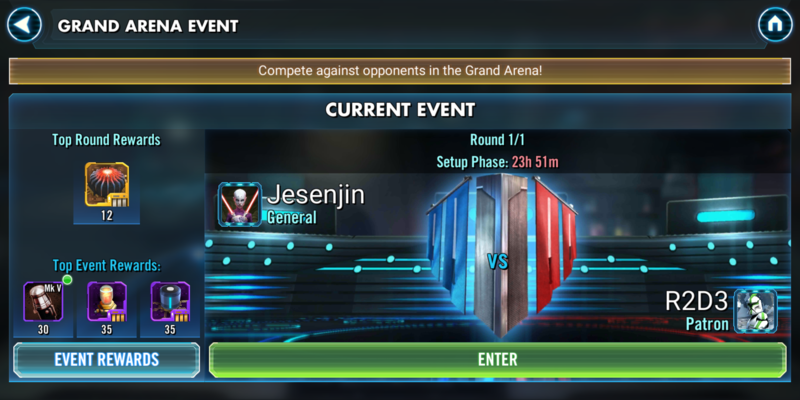 Using total GP for matchmaking in TW and Grand Arena in its own right is a huge problem of this whole system. Consider GP matchmaking as the two factors that they are: Ship and Toon GPs. Make them both separate matching factors, not one bundled. Worse offer, consider reworking ship GP over inflation. If its taken care of, the matching in TW and GA would be alot closer if values of ship GP factors (mods, abilities, pilot gear) are not sky high as they are now. So that players who are invested in fleet arena are not punished during TW and GA(where ships play 1/5 or 1/3 of the whole event while accounting for roughly 1/2 of a players GP). 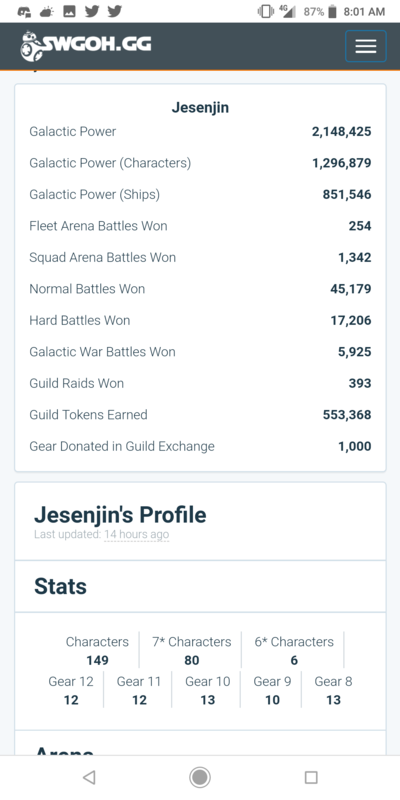 Its getting painfully obvious that ship GP is the problem to the matchmaking complaints of PvP events. Oh and also, that would come with a rework of ship aspect of TB. Or just get rid of crew power GP all together, and adjust TB ship sectors' scores required for stars. Crumb directly answered my question on it saying that it purely depends on GP. Somewhere in the first few pages of the update thread. Ha ha ha! I already lost mine. Derp... I confidently put my pre-built Resistance team into defense, only to realize that the game had defaulted to the pre-built HAAT teams instead of Territory War teams... So I've deployed BB-8 without Jedi Rey and now I'm just going to focus on beating one team with an under-strength General Kenobi team for quest progress. That'll teach me to pay more attention next time! 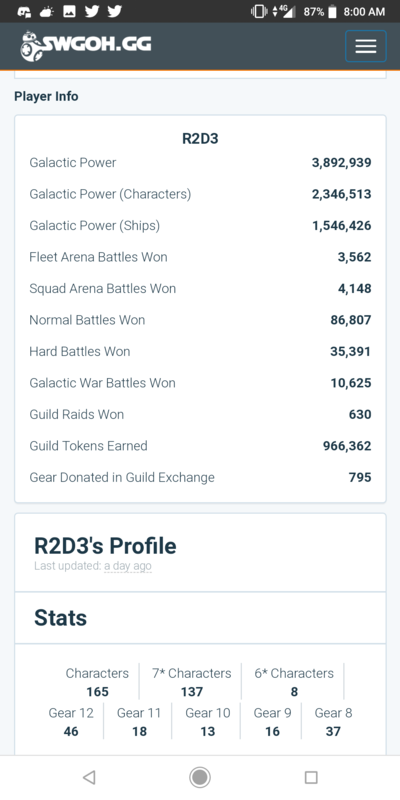 The guy I'm paired with has almost a million more GP than me... and also has G12 Revan and Traya. I was really looking forward to the Grand Arena, but this doesn't really look like "similar GP and characters" to me. @CG_SBCrumb As you ask feedback, scale the rewards with GP brackets. I am at 4.024M GP, and i will just remove all my mods from G8 toons to keep being at 3.9999M GP for the next events otherwise. 1) All our GP is taken into account and we are matched with similar GP and arena wins - this includes fleet gp which is currently unused. I'm sitting at 2,687,826 gp vs my opponent 2,688,077. At first glance it's pretty fair. He has nearly double my squad arena victories (I often only battle 1-3 times a day). However the disparity is in our squad inventory GP. 10 g12, 11 g11, and 8, g10 characters. It feels like I am going to get crushed here, no contest. Mods might help me out as I tend to have higher speed on many of my characters, but I don't have a super top heavy spread, I have more of a bell curve with the peak at g8 (38 characters). This puts me at a huge disadvantage. As time goes on I hope there are more calculations that go into matching players. As there are many factors and ways to play the game (f2p, p2p, focused farming, gearing based on character preference (favorites like Embo and crew members) vs gearing what's best for TW's and now GA. Anyway, that's my few concerns. Personally I just hit 4 mil gp and my opponent is the same. Our gearing priorities are polar opposites. Looks like I’m getting crushed to be honest. I really don’t care if I win or lose however the straight gp vs gp isn’t in my humble opinion a good way to match up. I’ve been playing since launch and fanboy farmed until I learned focus. I’m not sure what a better way of matchmaking would be or entail just saying that I see this game mode really making some really happy and most really angry. Just my two cents. Thanks guys good luck. I think this could be a very enjoyable game mode. I really like that it isn’t all about having one meta squad but several good teams and you really have to think strategically about what teams to set for def and what teams to keep for attacks. Yes it depends a lot on matchmaking algorithms but as long as it is a reasonably fair match up it will be great fun! That raid and token difference should be heavily considered as well if this event was a "true test of skill". I’m excited for this mode but it’s not the “ultimate test of skill” if you can look up your opponent before setting defense and counter their line up. I don’t know if someone has posted about this yet, but it should stay anonymous until the day of attacking so that players don’t know what they are facing and have to find a balance for defense / offense and use some kind of strategy instead of knowing that they have won before the fight has even begun. People being able to look at their opponents will just discourage them from being involved if they know they are going to get crushed. In summary, if you want this to be successful, hide name of opponent until attack day. Is this a new currency with a new store? I really think this should be a wake up call for a lot of people when it comes to mods, character farming, and gear. If you’re facing someone with the same gp as you but they have way better mods, better teams, more g12 characters or whatever the case, it’s basically telling you that you haven’t been playing this game correctly. Take it as a chance to refocus your efforts. If your opponent has 100 more 10+ secondary speed mods, I guess it’s time to focus on mods, right? If your opponent’s GP is focused on a relatively few all g12 meta quality squads you can’t defeat, I guess it’s time to stop spreading out and focus solely on one thing at a time, right? If your opponent has traya and g12+ gear and you don’t, I guess it’s time to find a new guild, right? To some extent the matchmaking has really revealed the differences between a focused roster and a bloated roster. Which of the two categories do you fit into? Be honest. If you’re here griping it’s probably the bloated roster category. Stop blaming CG for that and for giving you an opponent with the same gp but better roster. They aren’t to blame for that. Instead, take this opportunity to change how you play the game and how you use your resources going forward.